Around the Farm Table takes viewers through our farming landscape to shine a spotlight on Midwestern farmers and artisan food producers. The show is designed to uplift our understanding of sustainable farming practices through stories, recipes and information all delivered with a dose of fun, entertainment and original music. 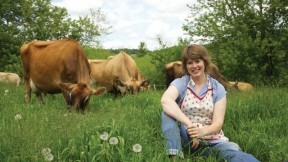 Our host, Inga Witscher, is a fourth-generation organic dairy farmer whose knowledge and disarming charm gets even the most quiet farmers to join in the conversation. Driven to seek out the best ingredients our region has to offer, each episode follows Inga as she gathers what she needs to produce a meal that celebrates our landscape and our appetites, Around the Farm Table.